In today’s world, accessing any kind of news from any part of the world is not that difficult. Thanks to Internet. Just put in the search phrase in the Google search form and you will get everything you want to know and more. Now, this true in case of most urban junta as they have access to Internet and latest smartphones at their disposal. The can get up-to-the-minute information on anything they want. However, think of people living in rural areas and hinterland of India. They still rely on television (but that percentage is also quite low) and majority of them access it on Radio for their news consumption. But information on Radio is broadcasted as per their schedule and does not give one luxury to know things at their own time. Additionally, one cannot carry radio through the day. Yes, mobile phones are there, but again most of them carry basic feature phones with simple features like voice calls and SMS with no mobile data. 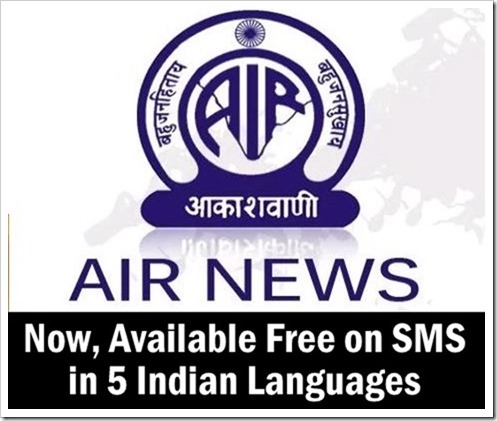 Keeping in mind this, Information and broadcasting ministry and launched free All India Radio (AIR) News SMS service in five Indian languages Hindi, Marathi, Sanskrit, Dogri and Nepali. This service is specifically targeted at rural Indians, and is aimed at providing important news to the subscribers in their preferred language on their mobile phones. This service will enable millions of rural Indians to get news on real-time basis. The news for this service will be provided by All India Radio (AIR) News service division. Last year in September similar service was launched in English free of cost. The subscriber base for same is now over 3 Lakh. Now, with launch of local language service, the subscriber base is expected to grow vastly. Check out the video of I&B Minister launching this service. Ministry is also planning to increase the awareness of this service by running a campaign through newspapers and Doordarshan TV channels. While this is a great service for rural Indians, even urban Indians who want to access local language news can subscribe to same! I want to unsubscribe AIR SMS service from my mobile. Please provide me the procedure to discontinue the SMS service. Mithun . I want to unsubscribe AIR SMS service from my mobile. Please provide me the procedure to discontinue the SMS service. To deregister from the SMS service Type AIRNewsstop to 7738299899. I want to unsubscribe AIR SMS service from my mobile. Please provide me the procedure to discontinue the SMS service. Naresh . please mention how to stop dm-airnws and dd-airnws. Am getting alienated characters. waste of money by sending messages to people with sqare characters. I have sent SMS for Malayalam news on 30 oct 14 and I am getting Marathi news regularly !In between I am getting Malayalam news like this -“some text missing* one word in Malayalam* some text missing.” PLEASE STOP sending SMS to me . DE ACTIVATE NEWS ON SMS SERVICE. I have also sent the sms’AIRNEWS’ to 08082080820 also. Kindly cancel and delete the unnecessary SMS to avoid duplication and confusion. shivcharan. How long does AIRNEWS activation take? Sending SMS I find is not free. Rs.1.20 is being charged per SMS.Is iit OK? shivcharan.